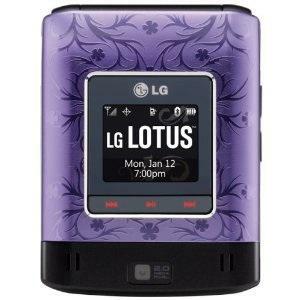 Just because it's technically not a smartphone does not mean that you cannot get applications for the LG Lotus phone. In fact, the popular mobile device can quite easily take on a wide variety of apps, not unlike that of the BlackBerry and Apple iPhone. While Sprint Android phones can be used to browse, purchase, and download applications from Android Market, the LG Lotus does not have exactly this same kind of functionality. Even so, it does have access to a specialized app store of sorts, thanks to the integrated software provided by Sprint in the United States. In order to download and purchase applications for LG Lotus phone, you will need to have the phone on hand. Opening it up and viewing the main home screen, press the "Menu" button to bring up the main options. From there, select My Stuff from the provided list. On this screen, you'll be able to see a list of categories for available content for your phone. In addition to the applications, you can search through to find various cell phone ringtones, among other content. To get apps, choose "Applications" from this list. On the resulting page, you will be able to choose "Get New" from the list of available options. This redirects you to the download page for new applications. Navigate your way through the online store until you find the application that you would like to download. When it is highlighted, press the "Menu/OK" button on your phone and the information page will appear. Click the "Buy" icon and the software will be download. Bear in mind that paid purchases will appear on your monthly Sprint bill. Since the LG Lotus supports the JAVA platform, the phone can be compatible with a wide range of both free and paid applications that make use of this technology. After you download Java applications to your computer, you will find that each application is actually comprised of two main files: one with a JAR extension and one with a JAD extension. You will need both of these files in order for these applications for LG Lotus phone to work. Also, not all Java applications are made alike, so double check that the app you choose is compatible with the Lotus. This is not only in regards to the core technology involved, but also the screen resolution and other factors. After you have the files, you can transfer them to your LG Lotus using a USB data cable. From there, go to the file manager utility on the phone and choose to run the JAR file. This should start the installation process, though some users online have noted that some applications fail to install for one reason or another. Compatibility is not guaranteed with third-party apps like this, so it is recommended that you stick with the apps available through the "Get It Now" utility that is pre-installed on the phone. What sort of applications for LG Lotus phone are available? Here are just a few examples to get you started. Opera Mini 5: Not a fan of the default web browser that comes with the LG Lotus? Try your hand on Opera Mini, a third-party browser application that works with this clamshell handset. Tetris Mania: Available through EA Games, this is an upgraded version of the classic puzzle game. Move those unique blocks around and form lines as quickly as you can. Need For Speed ProStreet: Put the pedal to the metal and race your way to greatness in this other mobile game from Electronic Arts. Gmail Java App: While there is a built-in messaging utility in the LG Lotus, the native application direct from Google may provide a better user experience overall. Want more apps? Surf through the "Get It Now" library and see what you can find!